"Somehow, not only for Christmas but all the long year through/The joy that you give to others Is the joy that comes back to you/"
"A signed book is the perfect gift," says owner Alice Hutchinson of Bethel's Byrd's Books, "and a wonderful stocking stuffer for young and old alike." To holiday gift givers an opportunity to do just that, Hutchinson will host authors Jessica Haight and Stephanie Robinson on Tuesday, December 18 from 5-6 p.m. The authors will discuss and sign their books, "The Secret Files of Fairday Morrow" and "Fairday Morrow and the Talking Library." 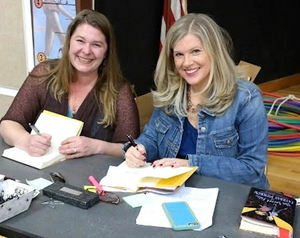 Haight and Robinson will be popping over from writing workshops at the Bethel Middle School to share how they came to write the adventures of young sleuths Fairday, Lizzy, and Marcus, how they got their ideas, and for those who are curious...what's coming next. The event is free; reservations are encouraged. To RSVP, click here.